Traffic school is an instructional program in driving and traffic safety that aims at enhancing your knowledge and skill level. Completion of a traffic school course, from one of the approved traffic schools, may keep a violation from showing on your driving record. This can prevent your insurance company from seeing the violation, and subsequently, raising your rates. There are several options for traffic school based on where you live. 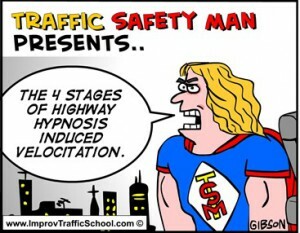 There are also virtual options, like online traffic by Improv Traffic School. Furthermore, the court may grant a request to attend a licensed traffic school if you have not attended for a previous violation within 18 months of your current violation. Additionally, those that have had a commercial driver's license or were driving a commercial vehicle when cited, are not eligible for traffic school. Many states, such as: Arizona, California, Florida, Georgia, Idaho, Missouri, Michigan, Nevada, Texas, New York, New Jersey, Virginia; now offer several options for traffic school to be taken online! For those foregoing online instruction, an on-site traffic school provides a classroom setting for instruction and attendance is mandatory. On the other hand, a home study traffic school program offers an alternative for those who may not wish to attend traffic school in person. If you choose this option, it will still cover similar information. The home study option allows you to study at your own pace, although, both programs must be completed within a specified amount of time and require you to pass an exam. NOTE: If you are eligible and decide not to attend traffic school, your automobile insurance may increase significantly. Also, if you fail to return your certificate of completion from traffic school, your case will be closed. The DMV will be notified of a conviction instead of a dismissal, and this will result in a violation point on your driving record, and likely increase your auto insurance. Traffic School is a term used for driver improvement courses in the United States. Depending on your location, traffic school may be referred to as a defensive driving course, driver improvement course, driver safety improvement class, traffic violator school etc. The original traffic school concept was created in California in 70s as a court diversion program for those with traffic tickets. Initially, it was taught in a classroom (i.e. stuffy basement of a local community center) by a moonlighting cop. While cops may know a lot about traffic safety, they may not necessary make the best teachers. Needless to say, spending 4-8 hours in a dark basement with a boring teacher can make for a long day…for everyone. Then an idea was born! Traffic school is the term used for driving courses covering safe driving practices and general highway safety. In the U.S., traffic safety courses are provided as a service to moving violation offenders often as a part of pretrial programs. While most traffic schools are seen as boring, long, and laborious, several businesses offer courses with a comedic touch, which are known as "comedy traffic school." In comedy traffic courses the curriculum and instructors are significantly more entertaining, which would theoretically make the class more entertaining and effective. When offenders receive a ticket or a moving violation, they can elect to take a driving course to decrease or completely negate the fine. At the same time, driving courses usually result in a significant reduction in the number points added to the driver's record. With direct correlation to an insured's insurance premium, the higher the number of points, the higher the insured's insurance premium will be. In most cases, drivers can only elect traffic school a certain number of times relative to the date of the driving infraction. This safeguard prevents people from simply driving recklessly and disregarding the highway laws without having to suffer the consequences from repeated abandonment. At the same time, the driving course encourages students to implement the driving practices they learned in the course. The classroom method provides the most traditional, face-to-face, instructor led user experience. In this case, the student listens to a live instructor who covers the curriculum. One of the major advantages of this type of driver improvement course is that questions and concerns can be instantly answered. The classroom times are set and scheduled based on the perceived most convenient time. In this setting, the student sits and listens to the instructor as they cover the driving rules of the state as well as other safe driving techniques. The exam in the classroom driver course is given under the instruction of a notary or the instructor. Once the student passes the exam, they are given their certificate. After the student is given the certificate, he or she takes the documentation to their respective court to have their driving record corrected or tickets dismissed. Internet courses lack the personal touch of the traditional classroom setting but is significantly more convenient. In most states, students are required to take a final exam as a condition of completion. After the student completes the class, he or she will receive either an unsuccessful or successful completion status. When the student completes the course successfully, the student will receive a course certificate. Some states send the certificate of completion directly to the Court/DMV, but other states mail it to the student's address. In this case, the student must take the certificate to the court to have applicable driving record points or tickets will be dismissed or removed. DVD/CD/ On Demand is another option for completing the course and presentation while at home. The user must purchase or rent the compact disc or DVD for instruction. On the other hand, the student can request a telecast. The student watches and listens to the driving rules of the state and various driving techniques discussed in the presentation. After the student completes the presentation material, he or she then takes the test in front of a notary to get their certificate. The student then takes the certificate to their respective court to have the points removed off of their driving record or to have the ticket dismissed. The offering of driver improvement courses isn't confined to the United States. Multiple provinces and states in Canada, Europe, and Australia also provide some form of traffic school. However, the course is administered and taken on a much larger scale in the United States. In most cases, an organization must be certified by either a traffic safety body or the organization's respective state. The providers who offer these courses are usually certified by respective state road/traffic safety bodies, such as the DMV, DOT, DHSMV, etc. Teenage and adult Drivers Ed or anyone else who doesn't have a driver's license.